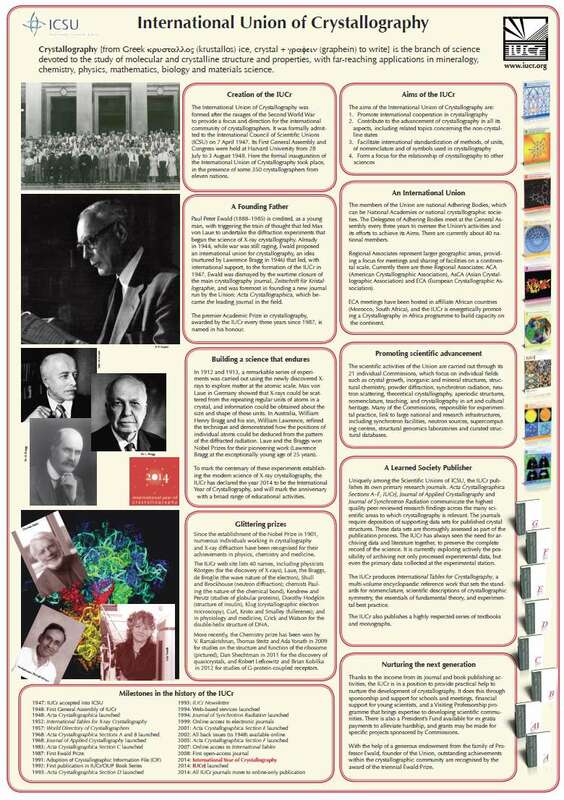 A poster describing the IUCr is available for download as a PDF file (A0 format). Click on the image above. In response to the 2015 Science International Accord Open Data in a Big Data World, the IUCr has prepared a position paper that provides a case study of best practice emerging in one particular field. In response to a call for input on Open Access to the 31st General Assembly of ICSU in 2014, Professor John Helliwell, IUCr Representative to ICSTI and CODATA, has drawn up two briefing papers, available from this page. In response to the prospectus for a multi-stakeholder Global Information Commons for Science Initiative, the IUCr has prepared a formal statement for submission by its Representatives to the Committee on Data for Science and Technology (CODATA) and the International Council for Scientific and Technical Information (ICSTI). This response and a position paper providing further details of the response are available from this web site. In response to the public invitation to submit evidence to the House of Commons Select Committee inquiry into scientific publications, the IUCr contributed a written submission Publishing Crystallography Journals in the Electronic Environment that summarises the Union's current practice and policy in the production and distribution of primary research journals.